46 by 76.5cm. ; 18 by 30in. London, Richard Green, Modern British Paintings, May 1984, cat. no.38, illustrated. T.G. Rosenthal, L.S. Lowry: The Art and the Artist, Unicorn Press, Norwich, 2010, illustrated p.179. 'You see, Sir, people think crowds are all the same. But they're not, you know. Everyone's different. Look! That man's got a twitch. He's got a limp...That woman, she's angry with her child. Those two have had a row; you can see it from their faces...The battle of life, sir. That's what it is. The battle of life' (The Artist, in conversation with Edwin Mullins and recounted in correspondence with T.G.Rosenthal, op. cit., 2009, p.183). In Lowry's best paintings, he is able to combine the great and the small: the expansiveness of a view over a town, the sheer size of an industrial building or the milling swell of a crowd, yet he never loses sight of the individual, their quirks and idiosyncrasies. In The Railway Platform we see this ability brought to the fore. Lowry was always drawn to places and events that attracted a crowd, and spontaneous street events feed the early paintings of the 1920s when Lowry was honing his style, titles such as An Accident, An Arrest, The Removal and Man Taken Ill giving a flavour of what caught his attention. It does therefore seem perhaps odd that railway stations do not feature more in his paintings. The continual comings and goings, a flowing populace irrespective of age, class or occupation, their potential as a venue for finding the displaced and the lost, the grandeur of buildings that might rival even a mill in scale, all these might be reasons to see Lowry treat this subject more often. However, when he did, the material he found springs out at the viewer as captivating and vibrant as any street scene. The platform of this station is crowded, thronging with figures from all walks of life. Businessmen chat, read the newspaper or simply stand with their briefcases, waiting for their train to arrive. Women with shopping and children are mixed amongst them, suggesting perhaps that we may be looking at a crowd waiting to go home after a day in the town centre. Skilfully Lowry weaves a curving line along the platform and back, taking the viewer from each little vignette to the next, very much the way we might if we found ourselves on the opposite platform, casually waiting for our own train and casting an eye over the scene. However, beyond the obvious setting of such a view, Lowry always manages to add some tiny uncertainties, and it is these that lift his work beyond the merely nostalgic and which have helped to secure his position as one of the most keenly collected British artists of the twentieth century. Initially our interest is centred on the individual characters depicted: Who are they, what have they been doing, where are they going? However, it is hard to escape from the feeling that whilst their platform is filled with activity and interaction, we, the viewer, are alone on ours. The drop to the rails and the inferred danger of crossing apparently precludes our joining them in any way, and thus like many of Lowry's paintings, the viewer is intentionally kept at a distance. This may in some way mirror Lowry's own life, where his friendships and relationships were kept carefully distinct, and one is left with a very clear sense of the artist's personal compartmentalisation. The nature of a railway station usually dictates that when one platform is busy, the opposite will be quieter. This crowd we see in front of us are off in one direction, we, apparently alone, are heading in the other. Whilst Lowry was often at pains to ensure that it was understood that he saw a crowd very much as a collection of individuals, each with their own story, he also was very much in tune with the simultaneous character of those same people as part of a larger body with subtly differing characteristics. Thus, whilst he picks out individual figures and throws a light onto them - the dapper gent leaning on a cane just to the right of the centre, the man who surreptitiously reads the newspaper over his neighbour's shoulder or the old clerk shuffling along the platform edge, perhaps to stand at the habitual spot he has occupied each and every working day as he waits for the train - we are aware of the whole crowd as a body with a purpose as distinct as a sweep of workers heading into the maw of the mill gate. It is interesting to speculate how the dating of this painting might suggest a relation to Lowry's own circumstances. In 1952, at the age of sixty-five, Lowry had retired from the Pall Mall Property Company. He had kept this aspect of his life relatively secret from many of his friends, perhaps due to his fear of being seen as a hobby artist or Sunday painter. Nevertheless, not only did his job enable him in the early years to get a form of accepted access to the poorest neighbourhoods in the city that might have otherwise been less open, but it also provided Lowry with a regular involvement with a working environment that had little to do with his painting. 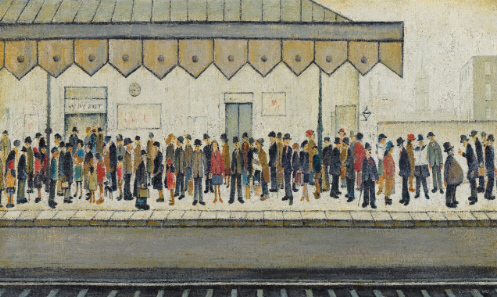 The removal from this regular and comfortable contact must have been a noticeable shift for Lowry who, whilst he had many friends, led a relatively singular existence and to see him produce an image of commuters on a railway platform, showing others in a position that more than anything exemplifies the everyday, repetitive nature of a working life, suggests a rather wistful yearning to be involved. However, even here, Lowry's ability to see both sides of a situation comes to the fore. For those gathered on the platform opposite, there is only the train or the Way Out, the shadowy exit that lurks in the background. Above them the painted wood canopy over the platform is transformed into something reminiscent of a huge toothed jaw, hanging above the oblivious commuters. Lowry was a cultured man, and his knowledge of art was extensive. It is therefore interesting to speculate that perhaps there is a nod here to the painters of the medieval and renaissance periods who regularly presented the damned gathered in or entering the mouth of hell. Whilst one could argue if a crowded compartment or stuffy atmosphere of a commuter train might really be compared with the endless torments of the infernal regions, there is no doubting that the feeling of endless repetition of the daily journeys to and from work might well make for a most humorous association.